This statistic shows the results of a survey on the usage of internet-enabled TV sets in Germany in 2014. During the survey period it was found that nearly 29 percent of respondents stated that they used their web-enabled TV to listen to music. The original German question was phrased by the source as follows: "Wenn Sie das Internet über Ihren Smart-TV nutzen, was machen Sie da genau?" 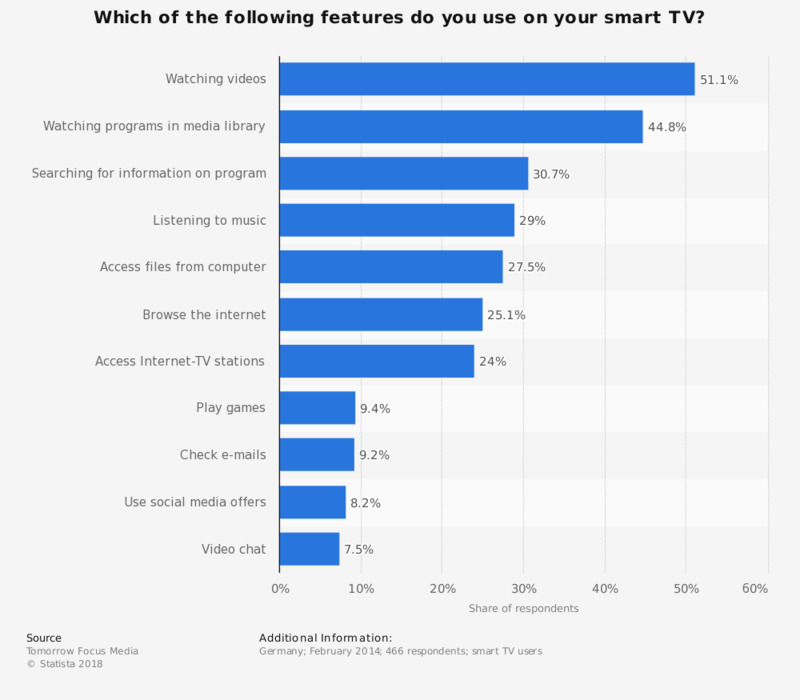 Statistics on "Smart TVs in Germany"
Do you plan to purchase a smart TV within the next 12 months? What features or content do you use on your smart television? How often do you use the internet on your smart TV? When do you use the internet via your smart TV on a weekday? Why aren't you using the internet on your smart TV?